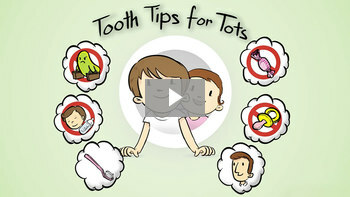 Babies can develop a form of tooth decay known as early childhood caries. This occurs when they are allowed to go to sleep with a bottle that's filled with anything but water. The sugars in formula, milk (even breast milk) and juice can pool around the teeth and feed decay-causing bacteria. When it comes to bedtime soothing, a pacifier or bottle filled with water is safer for developing teeth — that is, until about age 3. At that point, sucking habits should be gently discouraged to prevent problems from developing later on.